This is the project I'm currently working on...it's quilt top #49. I'm making this quilt for my niece who recently decorated her room with a log cabin theme. It's a surprise! The inspiration for this quilt came from this pattern....Jellystone by Miss Rosie's Quilt Company. I say inspiration because I've made a few changes. First, I'm making it a little smaller in width. Second, Miss Rosie's bear paw blocks are the most adorable bear paw blocks I've ever seen. I made one and loved it. In the end I thought Miss Rosie's block would not be appreciated by an 8th grader who would probably redecorate her room next year, so I went with a simplified bear paw block. I hope to have it finished this weekend. Speaking of Miss Rosie's Quilt Company, she is also the designer of the popular Schnibbles patterns. 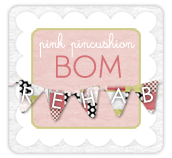 Sinta of the Pink Pincushion and Sherri of A Quilting Life are jointly hosting "A Year of Schnibbles Club". 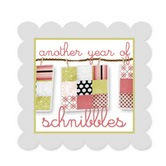 Each month all the members will make a Schnibbles pattern selected by Sherri and Sinta. Go check it out, it sounds like alot of fun and I'm going to give it a try. That is so beautiful Thelma! I need to get my pattern and just started project out and make a few blocks. I'm looking forward to the Year of Schnibbles Club too!